Belogradchik Rocks stretch from west to east in an area 30 km long, and 3 km wide. They are made of sandstone and limestone deposits with red, gray and yellow hues. Following the action of natural forces - rain, wind and sunshine - over 200 million years have formed shaped rock formations. Nature has shaped the sculptures of mythical creatures and people, animals and birds. They are majestic and amazing with their Beauty and diversity. Many of the Belogradchik Rocks are associated with legends. The Belogradchik Rocks are grouped into five rock groups. The central group of rocks is located south of Belogradchik. Here are the most interesting and impressive formations - Adam and Eve, The Schoolgirl, The Bear, Shepherd, First plate, Camel, Mushrooms, Cuckoo, Red Wall, Madonna, The Rider, The Monks, fighter Velko, Stone Pine and more . The second group is located west of the city. The rocks here are alpine species surround large gaps. 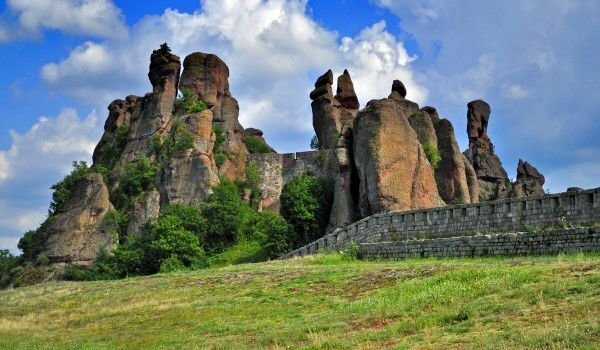 The most famous Belogradchik Rocks are Zbegovete, Erkyupria, Borich. East of town about 4 km south-east is the third group which includes the rock fortress and Latin Lepenishka cave. The fourth group is more famous: Pine Stone, Red Stone, Bee Stone, Lily scale. The last, fifth group is located around the villages Gyurgich and Belotintsi. Along with the odd shapes of the rocks, in the sandstone and limestone are formed over 100 caves - Rich in beautiful formations, ravines and interesting flora. The site is part of a movement created in 1966, called the 100 National Tourist Sites of Bulgaria.